In accordance with Impey's commitment to constant improvement please refer to the AQUADEC Easyfit range that offers the same comprehensive range of sizes with the benefits of additional strength, lighter weight and moveable waste outlet position. Go no further than Aquadec if you wish to build a wet room. A wet room floor tray ensures you start your job perfectly by taking the labour and guesswork out of creating the slope (fall) in the floor. As specialist suppliers and distributors of wet room shower equipment and specialist wet room products we can offer you great prices and friendly assistance - just call. If you want to do the job right we are here to help. If at any time you wish to speak with a member of staff we will be only too pleased to help. 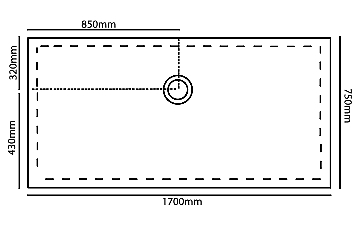 How much does it cost to build a wet room? If you approach the construction of a wet room in the correct manner the job can be made relatively simple and result in an absolutely fabulous creation you will be delighted with for years to come. The products we supply have been developed after years of testing and we know they're the best. It costs you nothing to ask for advice. We are always delighted to explain the way to achieve what you can see in your mind's eye. There is no obligation either, we are however confident that you simply can't buy better than AQUADEC at Shower Right. 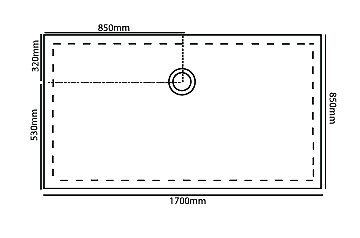 The Aqua-Dec Wet Room system has been designed to overcome the difficulties faced by the DIY or professional installer when trying to manually form a wet room floor. The Aqua-Dec reduces the manual labour and risk of mistake associated with this surprisingly technical challenge, providing consistent gradients and a cost effective, durable installation that will last the test of time. Please take your time and browse through the range of products that have been carefully developed over years to help you get the job right first time. The AD5 features a structural upstand as part of the design. This is essentially a raised border on the two sides of the deck adjacent to the outlet. 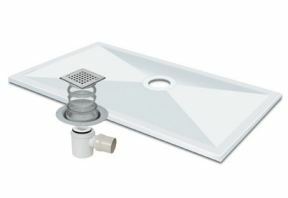 This allows the drain to be positioned as close to the corner as possible without loosing any of the structural integrity. Trimming may only be done on the opposite two sides (those without upstands).